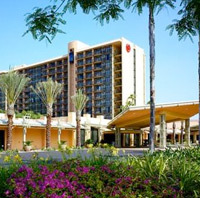 Walking distance to the Disneyland® Resort park gates: .7 miles. This hotel features guest rooms accommodating 4 Guests with crib, concierge, health club/gym, 3 Lounges/bars, parking, 3 restaurants, rollaway, room service, shop, swimming pool, spa, and local transportation. Get Great Disney deals delivered directly to your inbox!